Phoenix Books has been a hub of authorly activity lately! In addition to our events, we've had three wonderful authors visit us and sign books: Vermont authors Tamara Ellis Smith (Another Kind of Hurricane), Jonathan Mingle (Fire & Ice) and Linda Urban (Milo Speck) stopped by, as well as Canadian author John Farrow (The Storm Murders). Autographed books make great gifts - for others or for yourself! Milo Speck and Another Kind of Hurricane are wonderful choices for the middle readers in your life. Fans of Bill McKibben will love Fire & Ice, while those who enjoy Hercule Poirot mysteries will be thrilled to discover The Storm Murders. Jonathan Mingle's writing on the environment, climate and development has appeared in The New York Times, Slate, The Boston Globe, and other publications. He is a former Middlebury Fellow in Environmental Journalism, a recipient of the American Alpine Club's Zach Martin Breaking Barriers Award, and a graduate of the University of California, Berkeley's Energy and Resources Group. He lives in Vermont. John Farrow is the pen name of Trevor Ferguson, who has written eleven novels and four plays, all to extraordinary acclaim. His Émile Cinq-Mars crime series has been published around the world and cited by Booklist as "one of the best series in crime fiction", while Die Zeit in Germany suggested that it might be the best series ever. Tamara Ellis Smith earned her MFA in Writing for Children and Young Adults from the Vermont College of Fine Arts. She lives in Richmond, Vermont, with her family. Another Kind of Hurricane is her first novel. Linda Urban's debut novel, A Crooked Kind of Perfect, was selected for many best books lists and was nominated for twenty state awards. She is also the author of Hound Dog True, a Kirkus Best Book of 2011, the acclaimed The Center of Everything, and the fantasy-adventure Milo Speck, Accidental Agent. A former bookseller, she lives in Vermont. In Fire and Ice, Jonathan Mingle weaves a dramatic narrative of one village's inspiring efforts to adapt to a rapidly changing environment, and a scientific detective tale about the impact of fire on every nation. Ranging from the Tibetan Plateau to New York and Washington, D.C., from Delhi and Kathmandu and China to northern California, Fire and Ice is a heroic exploration of our race to change the fate of our planet. So begins Milo’s adventure in Ogregon, a place populated with hungry ogres, dino-sized turkeys, kidnapped kids, and—Dad? What’s Milo’s regular-old salesman father doing in Ogregon? For that matter, how did a shrimp like Milo end up there? He’s no hero. He can’t help those kids. Right? But there’s no time for Milo to get the answers. After all, hungry ogres like nothing more than a tasty bite of boy, and what kid is going to stick around for that? A fast escape back home to Downriver is all that matters—until Milo realizes that what’s really afoot in Ogregon goes far beyond an ogre quest for snack food. And his own family may be somehow mixed up in the dastardly plot. But what can a small boy in a very big world possibly do about that? 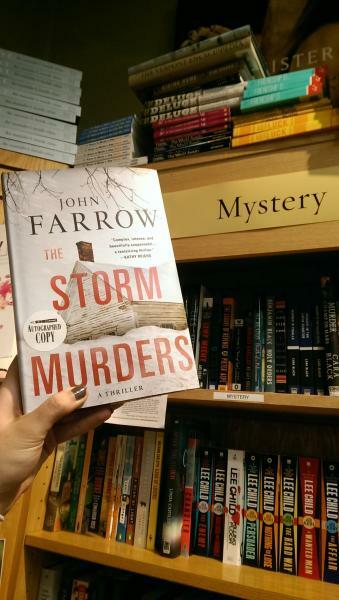 "The Storm Murders is complex, intense, and beautifully suspenseful-a tantalizing thriller." -Kathy Reichs, creator and producer of the Bones TV series.